This report focuses on the business of manufacturing and marketing chemicals that are used as ingredients in cosmetics and toiletry products. It excludes natural soaps (i.e., sodium or potassium tallowate or coconoate) as well as fillers and binders used in soaps. Ethanol (a large-volume solvent), fragrances, propellants, and dental polishing agents are also excluded. These issues have accounted for much of the recent new product development work and are likely to determine many of the future changes in the cosmetic chemical industry. The following pie charts show consumption of cosmetic chemicals by region and type, based on value. At present, North America consumes the largest volume of cosmetic ingredients. By 2017, however, China is expected to become the world's largest market for cosmetic chemicals. Growth rates for North America, Western Europe, and Japan are expected to range from 0.5% to 2%, while the market in China is expected to grow at an average annual rate of 8% during 2015–20. Approximately 1,000–1,500 chemical entities are recognized as cosmetic chemicals worldwide. This report groups these compounds into the major categories shown above. Products within each functional category often compete with one another, regardless of chemical similarities. The single-use additives category includes antidandruff agents, antiperspirants and deodorants, hair conditioning polymers and silicone fluids, hair setting resins, and sunscreens. The cosmetic chemicals industry is fragmented; hundreds of producers/suppliers provide the broad array of organic and inorganic chemicals that are the essential ingredients of cosmetics and toiletries. However, 20 or so major multinational companies control a substantial share of the cosmetic chemicals business. In most segments, between two and four companies dominate the market in a given geographical region. 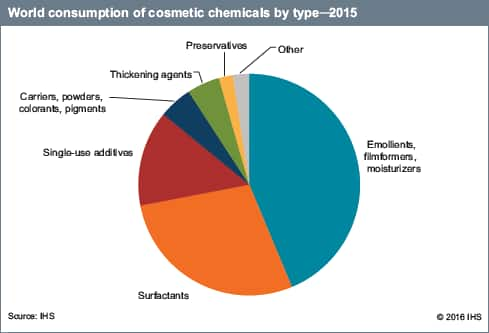 In North America and Western Europe, most cosmetic chemicals are sold directly to the cosmetics industry; a much smaller share is sold to distributors and small specialty formulators. In Japan, distributors and specialty formulators play a much larger role. 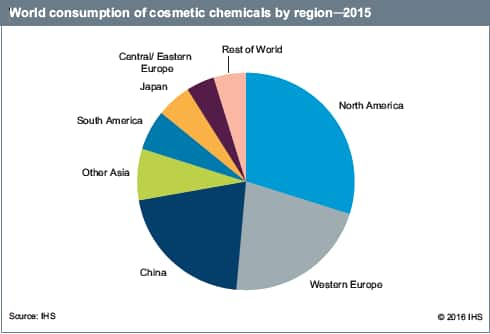 The growing need for higher-performance, higher-purity products and data documenting their safety and efficacy has improved the competitive position of the large multinational cosmetic chemical producers. These companies have greater resources available for R&D, technical service, and expensive, time-consuming health and safety tests. They can also use these resources to supply the large multinational cosmetic companies on a worldwide basis, further increasing their position as the leading suppliers to cosmetic companies. Producers of cosmetic chemicals have already adapted to these trends with increased investment in developing countries, many of which also offer rich sources of natural products that can be used in cosmetics. This trend is bound to continue as local formulators in these growing markets need both cosmetic chemicals that are easily available and assistance in advanced formulation technologies.